The authors’ writing has an almost musical quality, as if the stories were intended for recitation. The authors do not wish to altogether upset the legal system or unsettle the social structures that brought about these twelve injustices; rather, they modestly “attempt to listen to and gain a glimpse into” what twelve wrongly convicted men “held onto when they were tested in ways that would crush most people.” Read entire review. "The numbers are staggering. The statistics are sobering. TESTED isn't about the numbers. It's about the lives and stories of twelve men who were wrongly convicted. What seems genuinely surprising throughout is that the men retain their inner strength without giving in to bitterness or despair. But even as Peyton Budd retells the men's stories, those staggering numbers still manage to haunt." 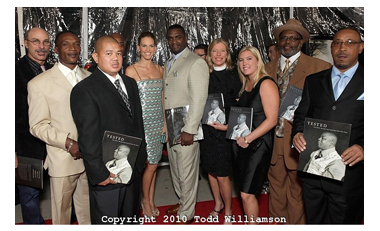 Hilary Swank applauds exonerees featured in the new book TESTED and authors Dori Budd and Peyton Budd, seen here on the red carpet at the LA premiere of Conviction.